The Maryland Real Estate Salesperson Examination consists of two separate sections. The first section is the real estate salesperson national examination with questions related to real estate in general. The second part is the real estate salesperson state specific exam that gets into the specifics of Maryland real estate laws. 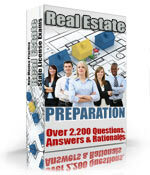 The national portion of the Maryland Real Estate salesperson exam is comprised of 80 questions. In order to pass the exam an examinee must answer 56 out of the 80 questions correct to pass (70% correct). The time limit allowed to complete the Real Estate Salesperson National Portion is 90 minutes. The state specific part of the Maryland Real Estate Salesperson Exam is comprised of 30 questions and an examinee must answer 21 questions correct to pass (70% correct). The time limit allowed for the state specific part of the Maryland Real Estate Salesperson Exam is 30 minutes. Real Estate Salesperson Examinations in Maryland are administered by PSI exams at www.psiexams.com. Before registering with PSI for the Maryland Real Estate Salesperson Exam you must first be 18 years old and complete the education requirements. After registering for the Maryland Real Estate Salesperson exam you must take and pass both exams within 12 months. In Maryland if you pass one part of the Real Estate Salesperson Exam you are permitted to take and pass the subsequent part at a later date as long as both are passed within 12 months. The Maryland Real Estate Exam will be administered by computer and your will results will be given to you immediately after completing the examination. The registration fee to take the xam is $70 whether you take one or both parts of the exam. The retake fee is 70 dollars whether you take one or both parts of the exam.